"...an exhilarating performance of the highest level." 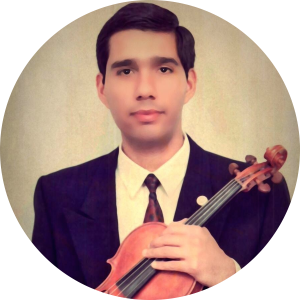 As a true exponent of the Russian violinistic tradition, Rigo Murillo has earned a warm respect from his listeners and colleagues for his well-defined musical expression, vividly multicolored tone, and his clear, yet spontaneous artistic eloquence. Rigo Murillo is able to capture his audience's imagination with an inspiring tone and a driving musical conviction. His exhilarating musical expression is able to engage even the youngest audiences. Rigo Murillo offers the most exquisite sounds to the avid listener. "Inspiring and outstandingly effective teaching!" Rigo has encompassed an outstanding experience by sharing the stage with world-acclaimed artists such as Itzhak Perlman, Yo-Yo Ma, Jean Pierre Rampal, Doc Severinsen, and Ray Charles, among others. Rigo Murillo’s musical leadership has taken him to excel as music director of the USM Civic Orchestra, director of operations of the USM Symphony Orchestra, and music director at Mount Sinai Congregation. Rigo has performed in master classes with renowned artists such as Mayumi Fujikawa, Gregory Feigin, and Alexandre Brussilovsky. He was awarded the McGraw Violin Chair Award. Rigo's exhilarating musical expression is able to engage even the youngest audiences. Rigo Murillo offers the most exquisite sounds to the avid listener.